If you like your gaming hardware to stand out from the crowd of black and gunmetal grey, Razer's new like of Quartz products may be for you. It's the same great laptops, keyboards, mice, and phones underneath, but on the outside they've been given a muted pink paint job. The Quartz range was introduced last year with a limited run of products. 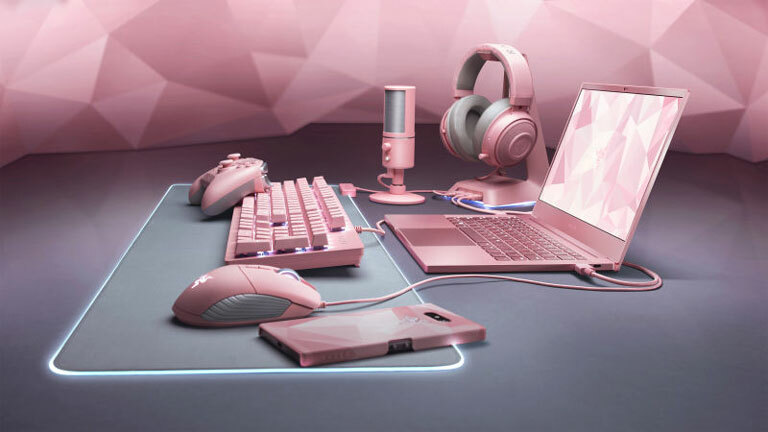 Following its success, Razer has now expanded it to include a microphone, wireless PS4 controller alternative, a headset stand, phone case, and a limited edition Razer Blade Stealth laptop, all in the same fetching rose pink. Typically Razer is known for its black paint jobs and in many ways it help push that as the mainstream "gamer" aesthetic that has been adopted by almost all peripheral manufacturers. Finding anything outside of the typical monotone colors is rather difficult. The most popular alternative is white which has begun to appear on cases and some laptops in recent years. Outside of those and the odd MacBook-like silver, though, your options are limited. Razer appears to be taking steps to address that. Arguably the flagship product in the new Quartz like is the Razer Blade Stealth which sports an Intel Core i7-8565U CPU, 16GB of RAM, and an Nvidia GeForce MX 150 graphics chip with 4GB of VRAM. That should make it a nice entry-level gaming laptop capable of playing most eSports games at high frame rates and any indies you can throw at it. That's not all that's in the lineup though. Check out the full range on Razer's official site. What do you think of the new Quartz line up? So now it's not just dog **** quality, it's also pink.. Great.